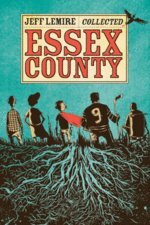 The book pulls together Lemire’s famous and award-winning Essex County trilogy (Tales from the Farm, Ghost Stories and The Country Nurse) along with previously unpublished material such as sketches and two additional stories. In an interview Jeff, who now lives in Toronto, says he was born at Grace Hospital but grew up in Woodslee and left the area in 1995 for school. Just like lots of kids Lemire loved comics. And he wanted to draw them. Two more recent books are Sweet Tooth and The Nobody (DC Comics) both set in the world of science fiction.